New year is perhaps the most important and anticipated holiday of the year. To make this celebration bright and memorable, you can not only decorate the interior, but also to decorate the holiday table with a beautiful bottle of champagne. - decorative thread cream or beige. First we cut out of orange paper squares and then wrap the candy to the middle. Previously on the candy wrapper you need to apply a small amount of glue to fix the paper into position. Paper green do a wide long leaves (like a pineapple). Next glue the bottle of champagne wrapped in a paper candy. To begin this process with the base of the bottle, moving the circumference up. The neck of a bottle must be left open. Glue the candies to the surface of a glass bottle on a normal paper glue will not work, you should use the high-strength glue (glue gun or "Moment). Once all the candies are glued, you can proceed to the decoration of the neck of a bottle. For this to the base of the neck fasten the cut leaves a pointed part up and rewind them with decorative yarn or satin ribbon beige color. A bunch of paper leaves you slightly flatten to resemble natural vegetation. 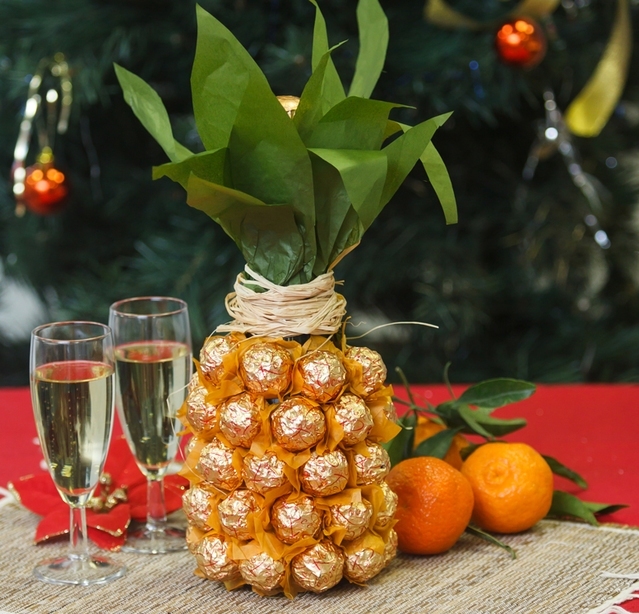 This bottle of champagne in a pineapple can decorate a festive table or give it as a Christmas souvenir.